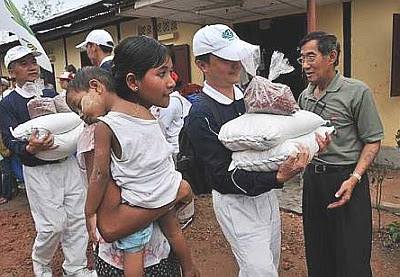 Tzu Chi is perhaps the greatest and most effective international relief organization in the world. The person behind this is Master Cheng Yen, who founded the Tzu Chi Foundation and is the spiritual mentor and motivator of all the Tzu Chi chapters worldwide. Whenever there is a crisis or disaster, Tzu Chi volunteers will be amongst the first to arrive to help and relieve those in need of help. These fully committed volunteers are always ready to spring to action immediately with love and compassion. No wonder they are compassionately referred to as the "Blue Angels"! Tzu Chi always delivers relief hands-on to the recipients with grace, love and humility and respect for the receivers. It is just amazing how Tzu Chi is so effective. Apart from international relief work, Tzu Chi has a wide spectrum of aids ranging from medical, social, to education. The Cancer Warrior, CT Chang leaves us today.